My mother has this quote on a picture frame with snapshots of her garden encircling it. I don’t think she knows where the quote comes from, but it spoke to her just the same. It happens to be from an essay in the 1970s that discussed Walker’s search into where her creativity came from. As it turned out, she concluded that her creativity was passed on to her from past generations of women in her family. My own love of art in the landscape and “landscape as art” was passed to me through both mom and dad. Their tireless effort in the yard, from mowing the lawn, to caring for the vegetable garden, to creating beautiful displays of blooms and fragrance sparked my passion. My mother also loves roses, which have been a symbol of love through the ages. We had shrub roses, tea roses, climbing roses, you name it, we tried it. Many of them did well, especially the pink shrub rose that we had on the southwest corner of the house—perfectly shaped roses with a perfectly pink complexion. I think it must have been an old knock-out rose bush that was really happy in its spot. Taking care of roses can be considered high-maintenance, especially for those that we love the most: the fragrant ones. Others are somewhat low-maintenance like the shrub roses and low-growing creepers. They need deadheading and some pruning to keep their shape but overall, they are carefree. The tea roses and other showy, fragrant, attention-seeking roses are a little more finicky. Whichever type of rose you choose, here are a few basic guidelines to get the best results. Roses love full-sun. They require six to eight hours of sunlight per day. They also prefer a location that has good air circulation; this also helps to fight powdery mildew and black spot. They prefer well-drained soils. If you have a clay soil, be sure to mix in compost or other organic matter to help drainage; add compost to sandy soils as well, to help hold onto moisture. The best time to plant roses is spring, after the last frost, or six weeks before the first frost in autumn. Roses need to be fertilized regularly for prolific flowering. I suggest organic fertilizers like compost, composted manure, or other natural fertilizers. This also helps to maintain a healthy soil composition. Keep your roses watered well, especially in dry, hot months. They usually require about one inch of rainfall per week. (However, they do not like “wet feet,” i.e. roots being inundated in water.) When watering, try not to splash the leaves as this can encourage the formation of black spot and powdery mildew. Roses can take a good pruning. Prune any dead areas first, and then cut back one-third to one-half of the shrub in early spring. Dead-head throughout the season to encourage reblooming. There are tons of new varieties of roses entering the market just about every year. Many of them are being bred to resist disease and provide better blooming. Do some research and talk to your nursery; they are there to help you along the way. I hope these basic guidelines give you the confidence and the encouragement to begin a rose garden. 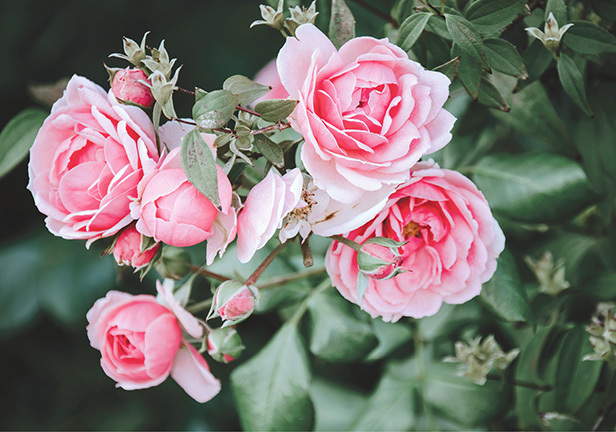 Whether occupying a sunny patch in the yard, climbing an arbor gateway, or filling containers on your patio, roses can bring joy and beauty to your home. And what better way to symbolize the love for another, then sharing a fresh cut rose from your garden.